1. Even more earnings: Morgan Stanley(MS) and BlackRock(BLK) will report their latest results on Wednesday. Investors will be watching to see whether they follow the trend set by Goldman Sachs(GS), which reported disappointing results Tuesday. Bank stocks were the biggest winners following President Trump’s election, but their rally began to fade in March. American Express(AXP) will report after the closing bell. The payments giant could provide clues into whether increased consumer confidence after the election has translated into more aggressive spending by American shoppers. 2. Pound hangover: The British pound slipped lower against the U.S. dollar on Wednesday, but still held above $ 1.28. The pound climbed over 2.5% on Tuesday after Prime Minister Theresa May called for an early election on June 8. May will appear in parliament on Wednesday to answer questions from lawmakers. Analysts say the election is likely to strengthen May’s political position ahead of Brexit talks with the European Union. The FTSE 100 retreated for a second straight session on Wednesday. Many of the multinationals that make up the index do business in foreign currencies and those earnings are worth less when the pound rises. 3. French election thriller: The French presidential election is heating up ahead of a first round vote on Sunday. Four leading candidates are fighting for two spots in a runoff scheduled for May 7. Investors are worried about two candidates in particular: far right politician Marine Le Pen and Jean-Luc Melenchon, who has been endorsed by the French Communist Party. Both are hostile to the euro. The difference in yields on French and German government bonds is now the largest it’s been since February, suggesting that investors see French debt as a substantially riskier proposition than German. 4. 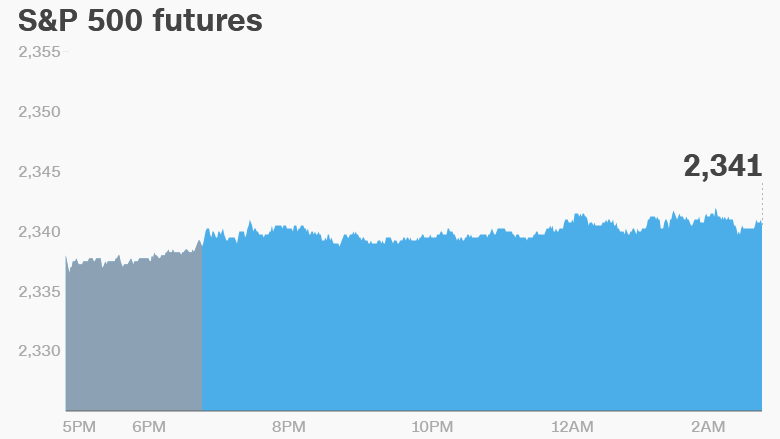 Global market overview:U.S. stock futures were higher on Wednesday. European markets were mixed. Markets in Germany and France opened higher. Most Asian markets ended the day lower. The Dow Jones industrial average shed 0.6% on Tuesday, while the S&P 500 declined 0.3% and the Nasdaq lost 0.1%. 5. Earnings and economics:eBay(EBAY) and Kinder Morgan(KMI) will release their earnings after the close. IBM(IBM, Tech30) was nearly 5% lower in premarket trading after releasing disappointing results on Tuesday. The latest U.S. crude inventories data will be released by the Energy Information Administration at 10:30 a.m. ET.